Neurotic New Yorker rents an RV and travels the country with his dog. 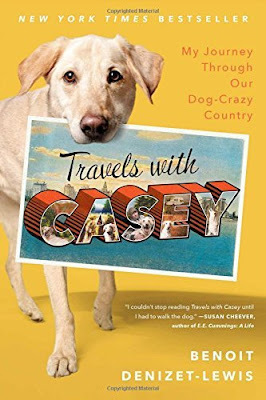 He visits various dog-centric people and places along the way. Apparently this author knows Josh Dean who wrote the book Show Dog that I reviewed back in March. It sounds like they were writing their books at the same time. Benoit and Casey came to Jacksonville. In fact, they were doing doga on the beach. I wonder if I saw him? Wouldn't that have been freaky? During his travels he met Amy Burkett from Go Pet Friendly -- one of my absolute favorite blogs! The story tends to meander. That's not bad, but it's not my style. I prefer more of a in-your-face John Grisham kind of story to a we'll-get-there-when-we-get-there Alexander McCall Smith kind of story. I couldn't care less about the author's love life. I'm NOT a romance reader by any means. I want to read about dogs, dragons and dead people, period. I really wish there had been more pictures.